At the close of the Battle of Gettysburg, approximately 22,000 wounded soldiers of both armies required medical treatment. Some of the more fortunate with minor wounds were able to be treated and quickly removed from the area though more serious wounded could not be moved. 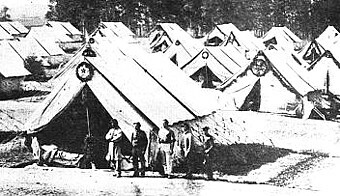 (Left) Picture of tents at Camp Letterman General Hospital, photographed by the Tyson Brothers in September 1863. Each tent is decorated with fresh boughs of cedar to ward off insects and cleanse the air. The town of Gettysburg is in the distance at the far right. Temporary "field hospitals" were established wherever there was a source of water and shelter, and every building was fair game: churches, farm buildings, private homes, and barns. For some, the only shelter available was provided by trees or a piece of canvas strung between poles. Wounded were everywhere, including a number of southern wounded left behind when the Confederates retreated. Lee's Medical Department attempted to transport many of their wounded back to Virginia though their suffering was terrible. Miles of wagons overloaded with wounded men bumped and jolted over muddy roads toward the Potomac, each bump causing more misery than can be imagined. Wounded southerners left behind may have been more fortunate. They fell into Union hands and were treated with equal care by Union surgeons already overworked by the vast amount of Union wounded. The hardships of the injured were only matched by the exhaustion of overworked doctors, attendants, and ambulance drivers. Regimental surgeons began the grisly task of sorting and treating the wounded while the battle raged. Surgical operations took place in the parlors of homes, in barns, or in the front yard of a farmer's house after which the wounded were set aside to be nursed by a handful of attendants. A steady flow of injured were treated by tireless surgeons who only took minimal rest and food during the days of the battle and the weeks that followed. Medical supplies began to run low as the battle ground to its bloody end and the situation was close to becoming a crisis. Treatment of the wounded left at Gettysburg was left up to the mercy of the Army of the Potomac. Dr. Jonathan Letterman, Medical Director for the Army of the Potomac, was not totally unaware of the difficulties in proper treatment of so many wounded and the difficulties his staff of doctors and regimental surgeons faced. Letterman had learned from his experiences in many difficult campaigns that proper medical care required swift action and the immediate disposal of staff, supplies and equipment within the battle area. Letterman also depended on the services of charitable organizations such as the US Christian Commission and the US Sanitary Commission to provide medical supplies and personnel to assist with temporary field hospitals and transport of the injured and maimed. As early as the first evening of the battle, Letterman had medical supplies, tents, and provisions on the way to Adams County. Dr. Letterman allowed regimental surgeons to do their work at the numerous temporary field hospitals, but knew that the hundreds of hospitals made support difficult on an already overburdened supply train. He issued orders on July 5, 1863, to establish a general hospital in the Gettysburg area and provide transportation and supplies to the site for treatment of the wounded. In his honor, the temporary hospital was named after him. The site chosen for the vast hospital camp was on the George Wolf Farm, roughly one and one-half miles east of Gettysburg on the York Pike. The farm was adjacent to the main road and the railroad where a depot was established. Arriving trains would deliver a continual flow of supplies for the Gettysburg camp and transport convalescents to permanent hospitals in Philadelphia, Baltimore and Washington. Wolf's farm had good drainage, water and a ready source of firewood. Hospital wards at Camp Letterman, September 1863. The hospital was ready by mid-July and staffed with a small army of surgeons, nurses, cooks, quartermaster and supply clerks while a detachment of infantry was detailed as camp guards to look after stores and hospitalized Confederate prisoners. 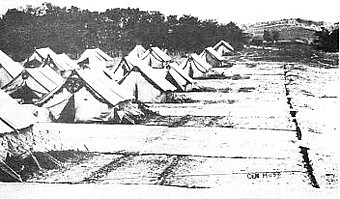 A steady stream of ambulances brought injured Yanks and Rebs to the camp where each man was assigned to a bed in one of the large tents or wards. Miss Sophronia Bucklin was one of the first nurses assigned to Camp Letterman and arrived in mid-July, ten days after the camp was opened. "The hospital lay in the rear of a deep wood, in a large open field a mile and a half from Gettysburg, and overlooking it, the single file of rail which connected the battletown with the outer world... The hospital tents were set in rows, five hundred of them, seeming like great fluttering pairs of white wings, brooding peacefully over those up between these rows in order that they might dry quickly after summer rains. The ground, now sodded, soon to be hardened by many feet, was the only floor in the wards." Open air surgery at Camp Letterman. Though Camp Letterman was primitive by modern standards, the hospital was vast and impressive. One tent had upwards of 40 folding cots with mattresses and linen sheets, a real luxury for soldiers that had lain on the hard ground or in hay lofts since being wounded. Nurses were assigned to a set of wards to bathe and feed the patients. A large cook house, built in the woods at the central heart of the camp, supplied soups, stews, and warm bread for meals. Warehouse tents were erected near the railroad to accommodate tons of supplies that arrived by railroad. A temporary morgue and cemetery were also established near the camp and deaths were quickly dealt with by a Christian burial attended to by an army chaplain. Agents and representatives of the US Sanitary Commission and US Christian Commission arrived and set up their respective headquarters at the camp. Both agencies provided services to the patients with nursing care as well as religious inspiration. Surgeons assigned to the camp worked around the clock treating the more seriously wounded while the ambulatory cases were set aside for transferal to permanent hospitals. Camp Letterman was filled to capacity by late July and eventually hosted over 1,600 patients. Hundreds more were treated by the medical staff in some of the temporary hospitals in Gettysburg churches and homes before they were emptied. 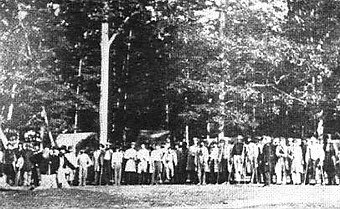 Wounded Confederates convalesce at Camp Letterman. Surgeons worked long hours in treating the wounded. Amputations were performed in front of a surgical tent pitched near the end of the rows of hospital tents. The surgeons were so skilled that the removal of an arm or a leg was accomplished in a matter of minutes and the unlucky soldier returned to his bed within the hour. Tools were washed with cold water and not properly sterilized, a common practice for that time. This lack of knowledge of bacteria and germs made for frightful cases of gangrene and tetanus, and infection was a major problem in the camp. Already weakened from the effects of wounds and surgery, those patients who suffered infections were also subjected to the added effects of diarrhea and dysentery. "The surgeon in charge of our camp, with his faithful dresser and attendants, looked after all their wounds, which were often in a most shocking state, particularly among the rebels. Every evening and morning they were dressed. Often the men would say, 'That feels good, I haven't had my wound so well dressed since I was hurt.' Something cool to drink is the first thing asked for after the long dusty drive, and pailfuls of tamarinds and water, 'a beautiful drink,' the men used to say, disappeared rapidly among them. "After the men's wounds were attended to, we went round giving them clean clothes, had basins and soap and towels, and followed these with socks, slippers, shirts, drawers, and those coveted dressing gowns. Such pride as they felt in them! Comparing colors and smiling all over as they lay in clean and comfortable rows ready for supper, 'on dress parade,' they used to say. And then the milk, particularly if it were boiled and had a little whiskey and sugar, and the bread, with butter on it, and jelly on the butter- how good it all was, and how lucky we felt ourselves in having the immense satisfaction of distributing these things. Two Massachusetts boys, I especially remember, for the satisfaction with which they ate their pudding. I carried a second plateful up to the cars, after they had been put in, and fed one of them till he was sure he had had enough. Young fellows they were, lying side by side, one with a right and one with a left arm gone." 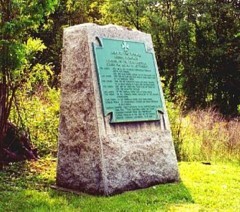 (Left) Picture of US War Department marker at the site of Camp Letterman General Hospital on the York Road near Gettysburg. Gettysburg NMP. Camp Letterman also experienced its share of visitors including families in search of loved ones. Adams Countians and curious civilians from Hanover stopped by the hospital to gawk at wounded Confederates reclining in the open air by their hospital tents. Treated with equal care by the Union surgeons and nurses, the southerners were later transported to northern prison camps. Many recovered from the effects of their wounds, after which they were paroled and exchanged to return to Confederate service. Less than 100 patients remained at Camp Letterman by November 10 and it was officially closed a few weeks later. Tents were removed, remaining supplies taken to Washington, and the sole cook house dismantled. George Wolf returned his farm to its original purpose with only the camp graveyard remaining as a reminder of what had been established there. There had been remarkably few problems with the hospital and Dr. Letterman's goals had been met in treating and removing the wounded from Gettysburg and the surrounding farms. Camp Letterman was a role model for future military field hospitals and as The Adams Sentinel reported, "The arrangements of the Camp Hospital were so perfect and such constant and prompt attention given to the wants of the wounded, that the sufferings incident to those terrible results of war have been much ameliorated and the brave soldiers, who were the sufferers, will never forget Gettysburg." Inevitable commercial growth in Adams County and around Gettysburg has obliterated a majority of the site of Camp Letterman. All traces of the camp where so many men were treated for their wounds at Gettysburg are gone except for a small portion of the wood lot adjacent to a memorial tablet, erected by the United States War Department prior to 1914, located on Rt. 30. Union dead in the camp graveyard were removed to the Soldiers National Cemetery in 1864 and southern remains were exhumed between 1872 and 1873 for relocation to southern cemeteries. "Adds a fascinating coda to the military campaign." About the Author: Gerard A. Patterson is the author of "From Blue to Gray: The Life of Confederate General Cadmus M. Wilcox," "Justice or Atrocity: Gen. George E. Pickett and the Kinston, N.C. Hangings," and "Rebels from West Point: The 306 U.S. Military Academy Graduates Who Fought for the Confederacy." Patterson has contributed more than 30 articles to "Civil War Times Illustrated," "American History," and other history publications. Recommended Reading: This Republic of Suffering: Death and the American Civil War. Editorial Review from Publishers Weekly: Battle is the dramatic centerpiece of Civil War history; this penetrating study looks instead at the somber aftermath. Historian Faust (Mothers of Invention) notes that the Civil War introduced America to death on an unprecedented scale and of an unnatural kind—grisly, random and often ending in an unmarked grave far from home. Continued below. She surveys the many ways the Civil War generation coped with the trauma: the concept of the Good Death—conscious, composed and at peace with God; the rise of the embalming industry; the sad attempts of the bereaved to get confirmation of a soldier's death, sometimes years after war's end; the swelling national movement to recover soldiers' remains and give them decent burials; the intellectual quest to find meaning—or its absence—in the war's carnage. In the process, she contends, the nation invented the modern culture of reverence for military death and used the fallen to elaborate its new concern for individual rights. Faust exhumes a wealth of material—condolence letters, funeral sermons, ads for mourning dresses, poems and stories from Civil War–era writers—to flesh out her lucid account. The result is an insightful, often moving portrait of a people torn by grief. Editor's Choice: A Strange and Blighted Land: Gettysburg, The Aftermath of a Battle. Description: The more dismal side of the Gettysburg campaign is covered: burials of Union and Confederate corpses, removal of the 3,000 horses killed, care of the wounded, descriptions of field hospitals, disposition of POWs, cleanup of the battle ground, collection of weapons, early relic hunters, battlefield guides, and a tour of the grim and bloody fields as described by a host of early visitors. Interesting historical accounts, statistical data, and pictures enhance this book. This research is not limited to the Civil War buff, it is a must read for the individual interested in medicine, medical procedures and surgery, as well as some of the pioneers--the surgeons that foreshadowed our modern medicine. Also, in the 1860s, the existence of pathogenic microorganisms was still unknown–many still blamed “malodorous gasses” for deadly outbreaks of respiratory influenza. 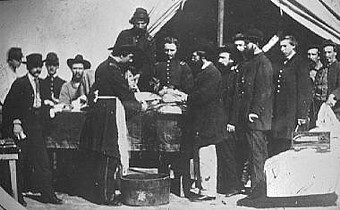 As the great Civil War surgeon William Williams Keen wrote, “we used undisinfected instruments from undisinfected plush-lined cases, and still worse, used marine sponges which had been used in prior pus cases and had been only washed in tap water.” Besides the substandard quality of wartime medical supplies and techniques, the combatants’ utter lack of preparation greatly impaired treatment. In 1861, the Union’s medical corps, mostly ill-qualified and poorly trained, even lacked an ambulance system. Fortunately, some of these difficulties were ameliorated by the work of numerous relief agencies, especially the United States Sanitary Commission, led by Frederick Law Olmsted, and tens of thousands of volunteers, among them Louisa May Alcott and Walt Whitman. From the soldiers who endured the ravages of combat to the government officials who directed the war machine, from the good Samaritans who organized aid commissions to the nurses who cared for the wounded, Bleeding Blue and Gray presents a story of suffering, politics, character, and, ultimately, healing. About the Author: Ira M. Rutkow is a clinical professor of surgery at the University of Medicine and Dentistry of New Jersey. He also holds a doctorate of public health from Johns Hopkins University. Dr. Rutkow’s Surgery: An Illustrated History was a New York Times Notable Book of the Year. He and his wife divide their time between New York City and the Catskills. Numerous sidebar articles appear throughout the text to embellish points of interest and a nice appendix is provided, as well as countless charts offering statistical data. Bollet's style is very reader friendly - you don't have to be that “med student” to enjoy it!